Andy Donnelly was born and raised in the beautiful town of Gourock on the banks of Scotland’s River Clyde. He moved to Alberta in 1978, bringing with him his deep love and knowledge of Celtic music. Now a veteran of Alberta’s folk music scene, Andy has been involved in many aspects of the music business, from radio broadcasting to producing concerts to writing and performing his own shows. As a touring musician, Andy has performed at festivals and concert halls across the country, singing songs and telling stories from his Celtic heritage. A devoted supporter of folk music in Edmonton, Andy was also a founding member of the Full Moon Folk Club and heavily involved in the famed South Side Folk Club of Edmonton. He continues to bring acts to Edmonton, particularly from overseas. 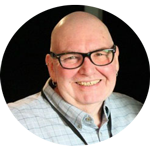 Andy joined the CKUA family in 1996 as host and producer of The Celtic Show. It wasn’t his first foray into broadcasting -- Andy has also shared his gentle brogue and passion for Celtic music at CJSR, Edmonton’s campus-based community radio station. Along with his friend Tom Coxworth, (a name listeners might recognize from CKUA’s Folk Routes!) Andy hosted a popular Sunday evening show called In The Tradition. Of all the joy that comes with The Celtic Show, Andy says he particularly loves broadcasting live from summertime festivals. The Celtic Show, a Friday-night staple since 1996, is hosted by an expatriate Scot and a veteran of Alberta’s folk-music scene, Andy Donnelly. With his soft brogue and wicked sense of humour, Andy entertains and enlightens his audience with the marvelous diversity of musical styles that reflect the influence of the Celtic tradition. Selections range from gentle, traditional ballads to hard-driving rock tunes complete with bagpipes. On any given show, you might hear the Tannehill Weavers, Dougie Maclean, Loreena McKennitt, Sinead O’Connor, the Rankin Family, the Pogues, Silly Wizard, the Chieftains, Christy Moore, Ashley McIsaac, the Waterboys and more. Touring musical guests drop by and share the magic that they bring to the airwaves.